The calming and sedative valerian. 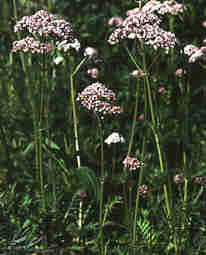 Common valerian, Valeriana officinalis, has a rhizome which when fresh has hardly any smell but when dried has a strong and very typical odour. The name valeriana appears in writing for the first time in a manuscript from the 10th century but it had, even then, long been known as a medicinal plant. It is still used mainly as a tranquilliser and mild sedative. Linnaeus noted that it was also used as a diuretic and against intestinal worms. Apart from its medical uses, it has a history within folklore as a magic herb, which could break the spells of elves and wights. It was used to avert evil and even change illness to health. Valerian extract is registered nowadays both as a drug and a herbal remedy. Scientific studies have shown that sleep quality is improved if you use valerian. Valepotriates are contained in the rhizome. They are chemically unstable and are decomposed during storage to, among others, valerenic acid giving rise to the characteristic smell.